Liu Xiu was not only known for his exceptional talent in military strategy. He was also known for being an open and honest man who bestowed rewards and punishments in a fair and transparent way. Because of a civil war brought on by Wang Mang (王莽), a court official who usurped the throne from the Liu family, the Han Dynasty is identified as having two distinct periods. With its capital in western Chang’an, the earlier period is known as the Western Han Dynasty (206 B.C.–A.D. 9). Later, the Han capital was established in Luoyang and historians refer to that period as the Eastern Han Dynasty (A.D. 25–220). Liú Xiù (劉秀) (5 B.C. –A.D. 57), or Guang Wu Di (光武帝) (“Brilliant Martial Emperor”), founded the Eastern Han Dynasty shortly after Wang Mang’s death and he immediately set out to reunify a divided China. A descendant of Liu Bang, Liu Xiu was instrumental in reviving Han rule by supporting a rebellion led by his cousin Liú Xuán (劉玄) against Wang Mang. In the period of time from Wang Mang seizing the Western Han throne to the establishment of the Eastern Han Dynasty, the civil war had devastated much of China. Soon after he proclaimed himself emperor, Liu Xiu adopted a series of policies to boost the economy and make peace with neighboring countries. This served to revive the Han Dynasty from its war-torn state. Rather than appoint war-time subordinates, Liu Xiu recruited well-educated scholars to manage national affairs. He believed that generals were good with martial orders but not with civil laws. He recognized that many of them had become too arrogant to obey orders or laws because they had developed heightened self-importance based on their achievements during the wars. Once his rule was secure, Liu Xiu awarded many of the generals with the title of duke and gave them great wealth, but he kept them out of government posts. Liu Xiu reinstated the previous system of centralized government by requiring local governors to personally report to him. Furthermore, he reduced the number of official positions. This was to prevent the dynasty from falling back into the hands of powerful ministers, dukes, and leaders of local clans. Liu Xiu recognized that the draconian laws introduced by Wang Mang had caused widespread resentment. His war experience had led him to prefer peaceful solutions over conflict; thus, as emperor, he was known to be decisive, yet to have great mercy. He issued amnesty orders many times to free slaves and release minor offenders from imprisonment. To correct an onerous tax system, Liu Xiu adopted minimal policies that reduced the tax burden. To encourage increased agricultural production, he reduced taxes on farmers from 10 to 3.3 percent. He also adopted a tax relief policy that eliminated the burden on elders, widows, and the poor who suffered the most from the civil war. To address border security issues, Liu Xiu reinforced the border infrastructures and improved the border defense system. Prisoners were encouraged to join military service on the frontier in return for reduced sentences. Liu Xiu is also reputed to have been strict with himself, yet to have treated others with great tolerance. During the civil war, many generals that had once been enemies joined him and he gave them a high level of trust. When a devastating earthquake occurred during his reign, Liu Xiu blamed his own lack of virtue as the reason for his failure to protect his people from the disaster. A key factor that led to Liu Xiu’s great achievements was his ability to exercise great forbearance. Liu Xiu and his older brother, Liú Yǎn (劉縯), had distinctly different personalities that led them to very different fates. 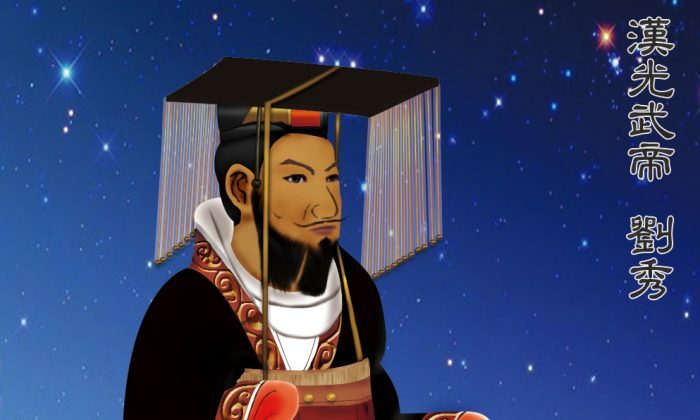 Before Liu Xiu became emperor, and despite the Liu brothers’ great military achievements on behalf of the resistance to Wang Mang, Liu Yan’s high-profile and larger-than-life character caused Emperor Liu Xuan to worry and to be suspicious of him, expecting a coup. While Liu Xiu was leading troops to fight for Liu Xuan in remote areas of the country, Liu Xuan had Liu Yan killed. This tragic news deeply hurt Liu Xiu; however, he suppressed his sorrow and showed even more modesty before Liu Xuan—which was the opposite of his brother’s prideful boasting and defiance. Liu Xiu not only refrained from publicizing his victories and accomplishments, but he also apologized for his brother’s behavior. This extremely humble attitude made the emperor regret killing Liu Yan, since the Liu brothers had greatly contributed to the re-establishment of Liu rule and the expansion of the empire. Liu Xuan decided not to punish or try to kill Liu Xiu, and instead rewarded him for his military achievements. However, Liu Xuan was considered a tyrant with a suspicious mind. Liu Xiu knew that although Liu Xuan didn’t consider him a threat, it didn’t mean that he wouldn’t kill Liu Xiu in the future precisely because of his great achievements and prestige. Liu Xiu kept a low profile and a humble attitude. He chose to forbear the loss of his brother and the hardships that arose from the emperor’s eventual suspicions. He accepted being sidelined until he had the ability to claim the throne himself. There is a story that demonstrates Liu Xiu’s admirable character through his ability to accept criticism and correct his own mistakes. After Liu Xiu became emperor, he assigned Song Hong as his grand minister. Song Hong recommended that Huan Tan be made a court adviser based on his knowledge and skills. Huan Tan was also an excellent musician and Liu Xiu liked his music very much. He had Huan play at every court banquet. Huan Tan knelt and apologized, accepting responsibility for his behavior. A few days later, at a banquet arranged for court officials, Liu Xiu again asked Huan Tan to play for him. Huan was about to obey when he saw Song Hong. He became afraid and didn’t know what to do. The emperor asked Song the reason for Huan’s hesitation. After hearing this, Liu Xiu felt ashamed for overlooking Huan’s advisory skills in favor of his musicianship and he apologized to Song Hong. During his 32-year reign as emperor, Liu Xiu vigorously promoted Confucianism, and he put great emphasis on “qì jié” (氣節), moral courage or integrity. Under Liu Xiu’s reign, Chinese society quickly recovered from the destruction caused by the civil war, social conflicts eased, and people lived peaceful and happy lives.